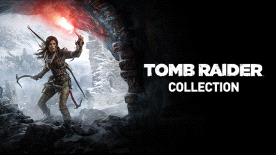 The Tomb Raider Collection includes every Tomb Raider title ever released for PC, including the award-winning Rise of the Tomb Raider and the celebrated top-down shooter Lara Croft and the Temple of Osiris. Tomb Raider © Square Enix Ltd. 2013. Square Enix and the Square Enix logo are registered trademarks of Square Enix Holdings Co., Ltd. Lara Croft, Tomb Raider, Crystal Dynamics, and the Crystal Dynamics logo are trademarks of Square Enix Ltd. The rating icon is a registered trademark of the Entertainment Software Association. All other trademarks are the property of their respective owners. All rights reserved.